Similar the the Underwood pickup. Available with just one element (Sh951) and two elements (SH950). 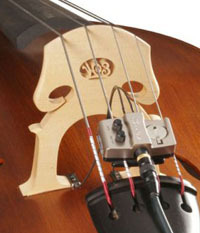 Similar to the Fishman pickup.The four piezo discs are attached to the bridge, one element underneath each string, with double sided adhesive tape. 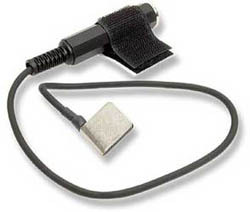 Basic single- or twin-disc transducer. The newest model from Shadow. The piezofilm elements mount under the bridge feet. The preamp is attached to the strings between bridge and tailpiece, and runs with a small 3V cell battery. Total pants, I fitted it and sent it back within 5 minutes made me want to throw up it was so bad, why the jazz lot use it, well maybe they don’t know any better, sad pickup. The sound of the bass with a bow is awfull! Playing jazz, the sound is not realist at all, except maybe on the last cord : E…I sold it and i’m trying to find something better. THE worst pickup ever! As soon as you play with a drum kit the bass is nowhere to be heard. Major problems with feedback – even with a preamp. Total rubbish! You get what you pay for. I think everyone commenting here should distinguish which particular pickup he/she is referring to since the different pickups are not comparable at all. I own the SH 965 NFX and I’m quite happy with it, though I haven’t tried the Realist (http://www.doublebassguide.com/?p=212) yet which is said to sound more natural in pizzicato playing. The SH 965 defintely has its strengths: a very good arco sound and active electronics (you can go directly into a mixer if no amp’s available). I’ve never had any serious feedback problems. I use the SH 965 NF-X for a mixture of pizz and arco, and while it lacks some of the top-end clarity of the Fishman BP-100, it has loads more pizz ‘kick’, and a far superior arco sound: you can get more dynamic range with the Shadow. Playing arco with the Fishman you had the choice of ‘play loud’ or ‘don’t play’, nothing in between. I think it might have taken a little bit off the unamplified volume of the instrument, having the transducers between the top and the bridge, but I may be imagining it: it’s a marginal difference if at all.